The first smart motorway in the north west is now fully operational and is expected to tackle congestion in the Greater Manchester area. Smart motorway technology has now gone live on the final M60 section between junction 10 and junction 18, meaning that the whole of the motorway between junction 8 of the M60 at Sale and junction 20 of the M62 at Rochdale is fully in effect. 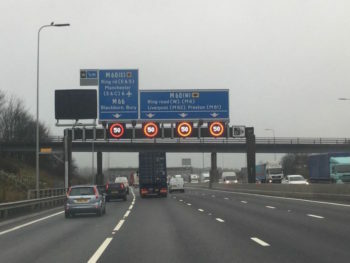 The scheme provides an extra running lane in each direction along the M62 between junction 18 and junction 20, as well as smart motorway technology, such as CCTV cameras and electronic signs, along both M60 and M62 sections. Drivers are also being encouraged to visit official Highways England advice on using smart motorways. Four more smart motorway schemes are also planned for the next few years and will see a project covering the M62 junction 10 to junction 12, which will link the M6 near Warrington to the M60 near Eccles, start later this month. Meanwhile schemes are also planned for the M56 (junctions 6 to 8), M6 (junctions 21a to 26) and M62 (junctions 20 to 25). However, motoring lawyer Nick Freeman, who has famously cleared celebrities for a range of road traffic offences, has spoken out against such schemes. And recent RAC research found 52% of drivers don’t know what an emergency refuge area (ERA) on a smart motorway is or that they should use them in the event of a breakdown or an accident in the absence of a hard shoulder.